Today was a bit of a housekeeping day in terms of my sewing . I decided to make a set of pattern weights for me to use as so many bloggers I follow use them and I think they would make it easier to cut out . I had seen an idea on another blog here. This gave me an idea of trying to make some myself. 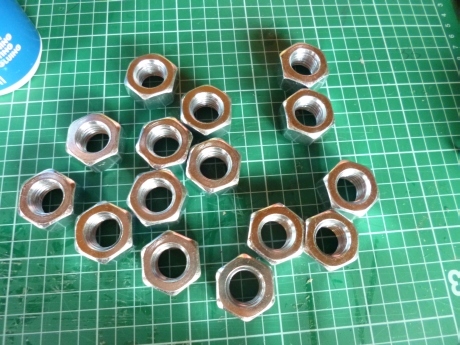 I took myself to the hardware store to find washers but came home with these nuts the biggest they had . They are a good weight for what I needed. 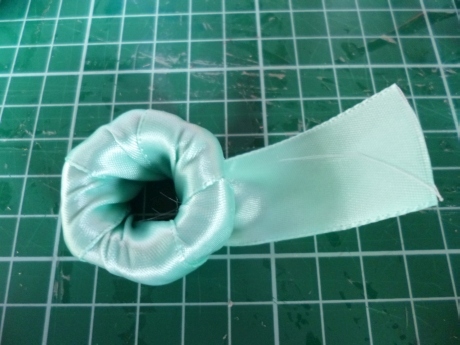 I used ribbon that I had on hand and also some PVA glue (wood glue) to bond the ribbon to itself. 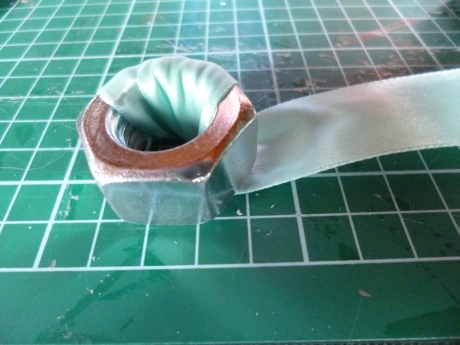 Once the nuts was completely covered I glued the ribbon and held it in place to dry with a peg. I made 15 in total so am looking forward to using them soon. The other part of my day involved receiving some pattern making books to borrow from a friend. They are amazing. These books contain patterns and instructions for some wonderfully clever garments . I have added them all to my birthday wishlist. If you love a challenge and ingenious design ideas you will enjoy these. I am thrilled to have a few weeks to play with them. I will post my creations as soon as they are done. This entry was posted in Uncategorized and tagged Drape, pattern weights, Shape. Bookmark the permalink. Nice pattern weights, I use beach rocks. I have one of the Drape Drape books, but I fell at the first hurdle, the tracing, very complicated. Sew Busy Lizzy has made beautiful outfits from the books, have a look at hers. Thanks for the tip I had a look at her blog wonderful stuff gives me hope that I can do it.